Just wondering how many of you have ever, or do hang out on the wire, or fancy doing it in future, let's hear your experiences, boat types when where etc. Have bunged down "have in the past", but can't do "may in the future", too. Well that's a surprise, 24 hours later, 24 responses and even split 12 have and 12 haven't, is that because there are not that many opportunities to give it a try I wonder. If you asked windsurfers you'd get 99% positive and the 1% would be a beginner waiting to hook in. I suppose the boats available other than my Farr are a bit technical, RS600, Musto Skiff, Contender, and or the twin or single trap boats are going out of fashion fast. Got to say I'm really surprised there are not more that have wired as a crew and only 1 fancies a try, I wonder if the poll said foiling what that would look like, not that I'm that interested. Thanks for taking the trouble to vote though, quite enlightening. Do you think trapping on boat is a bit different to a windsurfer in that it moves you a lot further away from the boat? Windsurfing you're effectively in the same position, with the same balance, but taking some load off your arms. Hooking in on a board increases your contact points from 4 to 5. 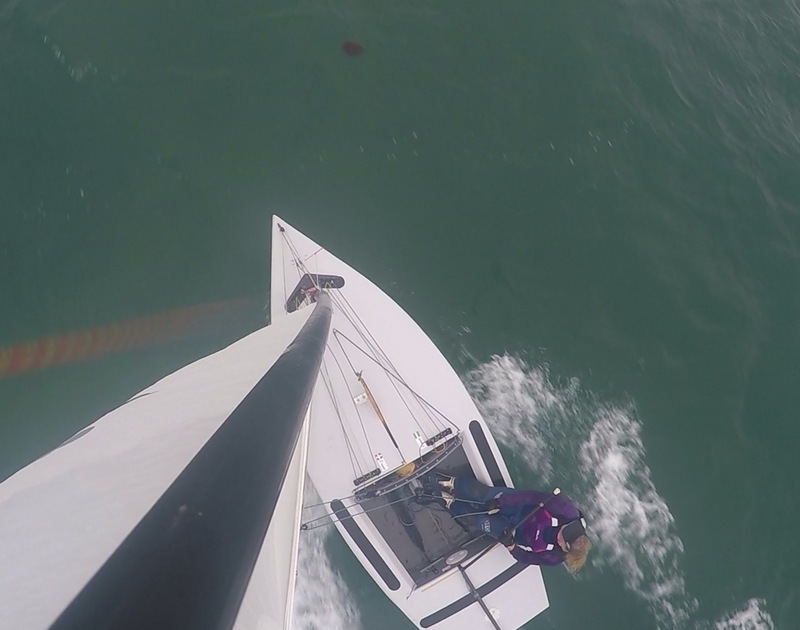 When you go out on the trapeze in a dinghy you lose a contact point plus the contact points you're left with are much smaller. I think trapping in a boat is a bigger step (literally and figuratively). Plus there are just some venues where trapeze boats just aren't suited, so it's not surprising the numbers are as prevalent as windsurfing. I think by far the best way to learn to trapeze is as a crew where the helm is hiking, even if the ambition is to helm from the wire. Yes, I'd pretty much agree with all that, I just thought it was a weird 'step' not having the boom to hang onto, but I guess it is true there's a certain sense of nakedness away from the controls, wiring as a crew is easier with only one hand needed for the jib sheet or spinnaker so in the early days you also hang on to the wire with one hand, at least I did at first. But once you're out there and comfy it is as good a 'rush' as anything, especially if your little boat footsteers like a board. My first foray onto the wire was in University 420s, then as a crew in ISOs, on Dart 18s, as crew and sometime helm in International 14, then RS600, then as helm on 49er then RS700. I've hung from a wire as crew and helm on Spitfires and Cherubs, crewed from the wire in Fireballs, 505s, BOSS and helmed from the wire on Dart 15 Sprint. I'd wired once on a Tornado roughly around the same time I started windsurfing ('78/9ish) then when I got back into dinghies (2008) I bought the Spice and, basically learned to trapeze, helm from the trap, fly an assy kite and relearn to sail a dinghy. The Spice was a perfect boat to do all that on and sailing it still gives me a huge buzz even though I mostly sail (and race) singlehanded in the Blaze now. The only downside (and reason for buying the Blaze) is the lack of a committed regular crew which relegates my Spice sailing to blasting mostly. Why are we not wiring anymore? Many reasons, but for me its a bit like running or windsurfing - there's a certain pleasure in having a good workout while sailing and seeing direct effort turn into performance. That's not to say that wiring isn't physical - just a different sort, maybe more akin to cycling maybe.